This question comes up again and again… and honestly, the answer this question has changed in recent years based on new laws enacted that affect what a home owner can do when they’re selling their house under a rent to own agreement. One of the big benefits of owning a house is that you (hopefully) earn equity as you make payments and pay down the mortgage. One thing many home owners don’t take into account is that really during the first 5 years (or more) the majority of your mortgage payment to the bank is interest… and very little of your payments for the first 5 years actually goes to pay down the principal and earn you equity. But on the flip side, the 2nd half of your mortgage is usually where the majority of your equity is earned since most of those payments go to the principal. 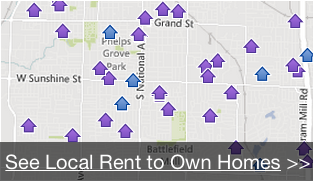 So how does it work with a rent to own agreement? You and the rent to own house owner agree on a monthly rent, a “move in” type fee that basically pays for the privilege to have the opportunity to purchase the home late, and the price of the purchase at the end of the rental agreement if you want to buy it. You move in and pay your monthly rental payment and treat the house great (since you may be owning it someday). In the old days of lease options / rent to own agreements, a home owner was allowed to let a portion of the monthly rental payment be applied to the purchase price as a pre-paid down payment. This was great for everyone! It helped the tenant buyer earn money off of the purchase each month they made a payment… and it helped the house owner sell the house more often at the end of the rent to own agreement since now the tenant had some “equity” in the deal. But in recent years a bill was passed in Washington D.C. called the Dodd Frank Act that has placed restrictions on rent to own programs… and has limited the ability to apply rental payments to the end purchase of the home. One of the great benefits of renting to own a Columbia house is that you get the ability to have the home seller agree to sell you the house for a price you agree upon today. And the beauty is… if the market does really well during your rental term and the house goes up in value a lot… the seller can’t raise the price on you. So whatever home value growth happened during your rental term over and above the sales price… that’s your equity! Now, is there a guarantee that the value of the home will go up and you’ll earn equity? No, but just make sure that when you’re negotiating the rent to own agreement that you really do a bit of research and see if the area the house is in has a good chance of increasing in value or not. Then base the purchase option price on that. Before we wrap this article up… you may have the question of whether you HAVE TO buy the house at the end of the rental term. The answer is no. If you decide you just don’t want to (or can’t) buy the house at the end of the rent to own agreement… you can just continue to rent if the owner will allow it or you can leave. You’re not bound to purchase the house. However, the seller is bound to sell you the home at the predetermined price as long as you followed the contract terms (i.e. – you didn’t miss payments, you weren’t evicted from the house because of a breach of the rental agreement, etc. etc. ).